Hail covers the second green of the Pebble Beach Golf Links during the final round of the AT&amp;amp;T Pebble Beach Pro-Am golf tournament on Sunday, February 10, 2019, in Pebble Beach, California. Play was suspended after the hailstorm. 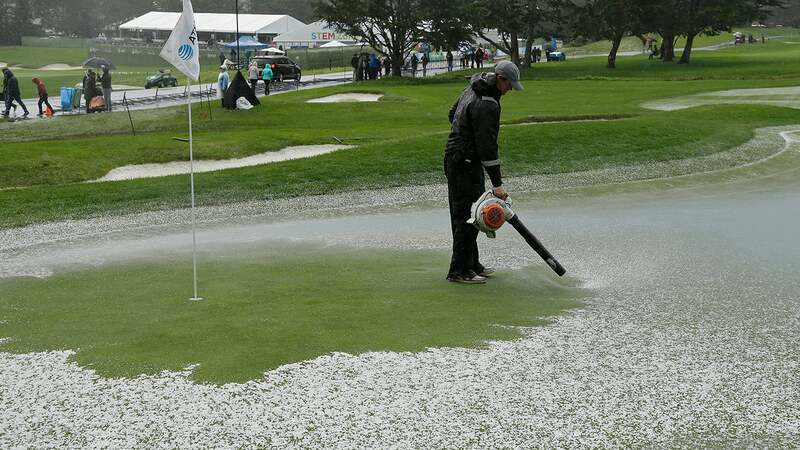 Hail quickly covered the greens at the Pebble Beach course. The final round was delayed for several hours. The tournament will likely be completed on Monday. The frozen pea-sized pellets soon covered the greens, and play had to be suspended. Paul Casey had a three-shot lead over Phil Mickelson at the time. Play was expected to resume at 1 p.m. local time. The final round earlier had been delayed for one hour because of rain. The tournament will likely be completed Monday. Workers used squeegees and leaf blowers to remove the hail. A greenskeeper uses a leaf blower to clear hail from the second green of the Pebble Beach Golf Links during the final round of the AT&amp;amp;T Pebble Beach Pro-Am golf tournament Sunday, February 10, 2019, in Pebble Beach, California. Play was suspended after the hailstorm. Temperatures had been in the mid-40s, but wind chill made it feel like the upper 30s. It was the type of weather that once gave the event its reputation. It was known as “Crosby weather” when Bing Crosby was the tournament host for the better part of a half-century. The tournament has been on a great run for the last two decades, with a few exceptions. Dustin Johnson won the first of his two titles in 2009 when the final round was delayed until Monday because of rain, and then canceled because the storm system wouldn’t leave. Si Woo Kim, second from right, of South Korea, stands with a rules officials and watches greenskeepers clear standing water from the second green of the Pebble Beach Golf Links during the final round of the AT&T Pebble Beach Pro-Am golf tournament Sunday, February 10, 2019, in Pebble Beach, California.